If you want a fancy looking breakfast in just minutes, then this is it! 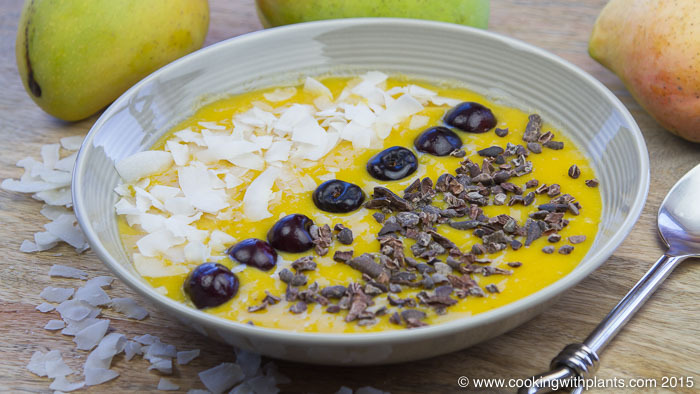 This mango breakfast smoothie bowl is so easy to make, tastes great and is really good for you. Place mango, banana and coconut water into a blender and blend until just combined! Pour smoothie mixture into a flat bowl and place cherries across the centre of the bowl. Put cacao nibs on one side of the cherries and the coconut flakes on the other. Enjoy!